I see Jim Lichtenstein there. Didn't he tell everyone to move on, stop their interest in this case? Thank you so much.I knew that was him. I suppose he could have been there only for a work assignment. I just found it a bit odd that he was there at all, after the above tirade. Thanks Trimm! I couldn't believe Greene, on Casey's behalf, said...We aren't seeking money. WTH?? I guess they want to, but know that just won't float. Morgan was good at pointing out Baez's NYC trip and BW and why he was there. (Although, I'm pretty sure John Morgan could dine at that Italian restaurant any time he wants to......or any restaurant for that matter. I just got a chuckle out of him saying that. ) Bottom line, though, her special treatment needed to end back on June 16, 2008, as far as I'm concerned. Morgan's points on that should be all the Judge needs to be reminded of. Let the video be released! Me too,no tweets from him today either. 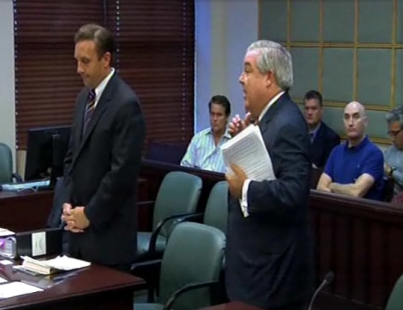 Waiting for the start of a hearing to determine whether new #CaseyAnthony depo video can be released. Did anyone actually see and hear the hearing? Things got heated....I love to watch JM when he gets riled up. 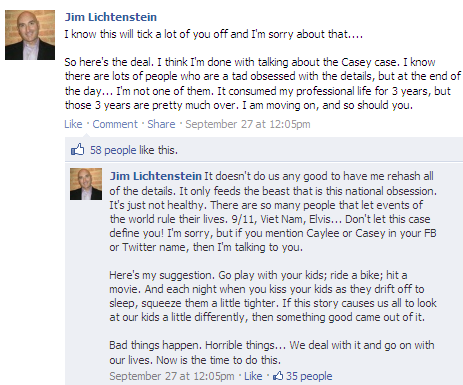 I also love that he said it like it is.....Casey thinks she's special, etc. It's time to treat her just like any non celebrity citizen, which is what she is. I so agree; I love watching John Morgan in action too; It seems to me that not deciding for ten days is a bit much. Mr. Morgan is so on target! I bet it will be released.. I am wondering if the transcript will be released and the video remain sealed. Hard for me to second-guess this Judge. Gonzalez's attorney, John Morgan, argued on Thursday that Anthony should not be given special treatment and the video should remain unsealed. Morgan also noted that by releasing the video to the public, Anthony stands to make less money if and when she decides to sell her story. Anthony never specifically identified this woman, and during her murder trial in Caylee's death earlier this year, Anthony's defense team claimed Caylee was never kidnapped, and had drowned in the family pool. Anthony was found not guilty of murdering Caylee and is currently serving one year of probation on an unrelated check fraud conviction. Anthony remained silent because she is still appealing her conviction on four counts of lying to law enforcement in the investigation into her daughter's disappearance. Anthony's lead attorney Charles Greene was not present on Thursday after a boxing match in the morning hurt his front teeth. She was represented by one of the co-counsels in the case. Meanwhile, on Wednesday, a judge ruled that another lawsuit against Anthony, filed by search group Texas Equusearch, could go forward. The search group said it wasted thousands of dollars searching for Caylee when Anthony already knew where she was -- her body dumped in a wooded area near the Anthony family home in East Orange County. That is kind of funny. I wonder if his boxing partner doesn't like what Greene is doing for the murderer, and found a way to unleash his fury!!! I'm hoping that Casey will feel cocky enough to go out on Halloween, get herself into some sort of probation violation and end up back in jail. That's my Halloween wish! Just learned there will be book signings in Miami, Jacksonville, New Symrna Beach and probably St. Petersburg, in addition to Orlando and Vero beach. Will give more info as I receive it. I'll have to hit the St. Pete one.....Orlando is closer, but I bet it will be a major mob. I can't wait for this book. Does anyone know how long it's going to take to have the appeal heard on the crimes the murderer was convicted of.....lying? I hope it's sooner than later, because the appeal seems to be holding up the other cases. How long is this going to be drawn out? I don't even understand why it's being appealed, other than it's her constitutional right. But come on.....there is no doubt that she lied. You should check out the nasty comments on his FB page! Someone laid into him saying he is looking for a deal for them, etc. Page created in 6.216 seconds with 21 queries.